Serafim is a dark and cruel report of a world destroyed by a disease, and about desperate masses of people looking for salvation. In the fifteen years since it creation, it has not lost an iota of its power and relevance. Unfortunately, the manga was never finished, as the two men focused on their careers in animation. 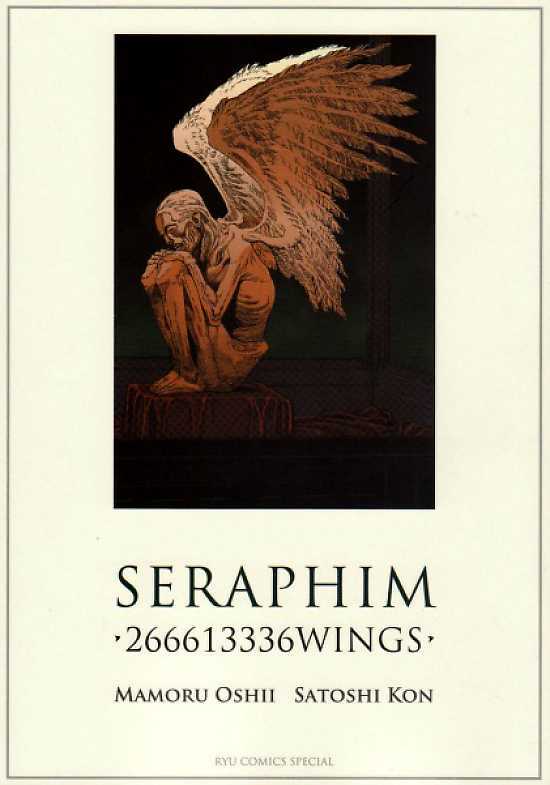 The humankind is succumbing to serafim, ”the angel disease”. It is believed that serafim started to spread from a huge apartment block in South-East China, more than ten years ago. Millions of dead bodies have already been buried or burned, millions of people suffer from the disease. Entire cities are deserted. Angel disease withers bodies into skeletons and deadens the minds. In the end, it kills. The most prominent symptoms of the disease, however, are distorted wings that start to grow up from your shoulder blades. The whole human race is threatened. Or does Mother Nature have some secret plan – perhaps hundreds of millions of human lives need to be sacrificed to complete a transformation into angels? The angel disease spreads among people. THREE Wise from The World Health Organization are on their way to the source of the disease. They are the ”magi” Balthasar, Melchior and Gaspar. Yes, they have the same names as the three magi who traveled to Bethlehem to see the new-born child Jesus. This story picks also other elements from Christianity and Chinese religins. Mages are not three wise men, as only two of them are people. Balthasar is a scientist, Melchior is a warrior. 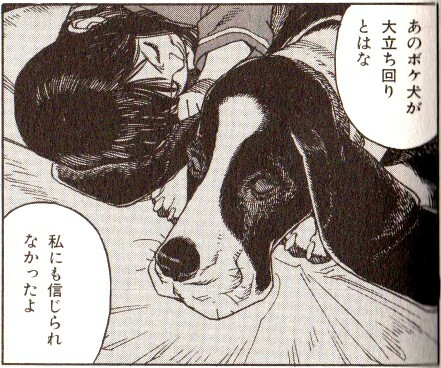 Gaspar is Mamoru Oshii’s favorite dog, a giant basset. Melchior has the early symptoms of the disease. He survives by using an experimental medicine that slows down the progress of the disease. Balthasar and Melchior both have their own secret goals which the other one does not know. Both also use methods that the other one does not accept. Gaspar alone is sincere. Balthasar, Melchior and Gaspar study the starting point of the disease. They have available all the resources of the world community, including fighters, warships and helicopters. IN THE center of the story is the quiet girl Sera. Traveling with the three wise, she speaks not. But the girl of ten watches and touches. Balthasar found Sera ten years ago. She was the only survivor in a city that was completely destroyed by the angel disease. In her body, Sera may have something that is able to resist serafim. Some see Sera as the re-born Maso, who has come to save the humankind. Maso or Mazu is a deity who protects fishermen and sailors on South-East Asia. Others see Sera as a Devil’s child, who must be destroyed. But Sera has strong defenders. Fierce Gaspar is ready to give his life to protect Sera. 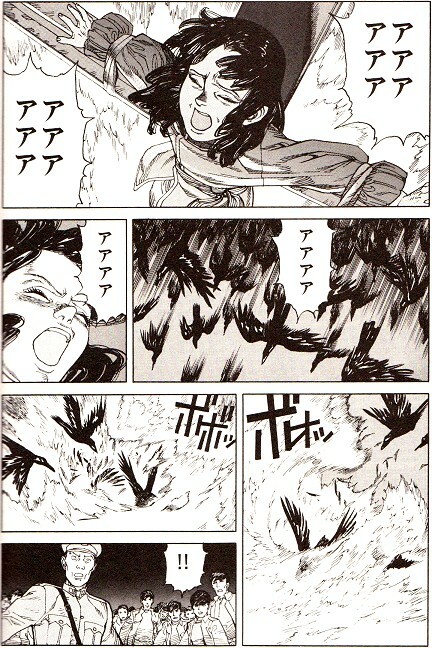 Maybe also Gaia, Mother Nature herself, is on Sera’s side: When people try to burn Sera on a cross, a huge flock of birds saves her. Third, some see Sera as the hope for a medicine to cure the angel disease. Even though they’re protecting Sera, they may, if necessary, milk her to the last drop of blood. But there is beauty in the midst of the gloom. 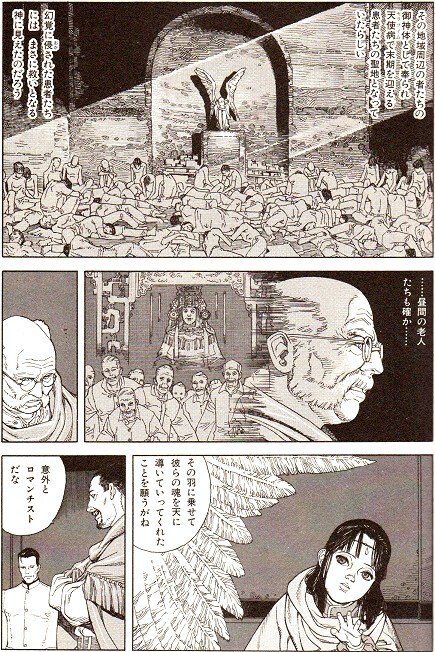 KON and Oshii finished 16 chapters (230 pages) of Serafim. The manga was published in Animage-magazine from May 1994 to November 1995. Just before last Christmas, it was re-released in paperback in the series Ryu Comics Special. In those sixteen chapters Mamoru Oshii and Satoshi Kon just have time to show the ingredients of a huge story. 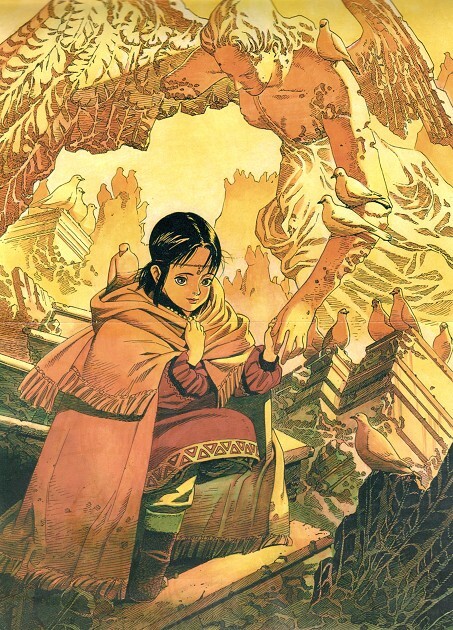 Among manga, it may only be compared with Hayao Miyazaki’s Nausicaä. Unfortunately, we will never know how the history of Serafim would end. When Oshii and Kon created Serafim, AIDS and Ebola were already familiar to the general public. Bird influenza and swine flu were yet unknown. In a sense, however, Serafim describes exactly the worst case scenario of these diseases. Thus the manga is now more up-to-date than it was when it was made. As Miyazaki’s Nausicaä, Serafim also builds a whole new world with its peoples and nations. It is perhaps even more convincing than Nausicaä’s world, as it is closer to our reality. If Serafim had been completed, it would undoubtedly be one of the great masterpieces of manga. I HAVE now read three of Satoshi Kon’s manga works, two of them unfinished. I am increasingly convinced that in mid-1990s, the anime industry robbed from us one of the best manga artists ever. Mamoru Oshii and Satoshi Kon have both made ​​a number of animated films that are among the genre’s most important works. Both are known far better as animators than as manga artists. Satoshi Kon died of pancreatic cancer last fall, at only 46 years of age. His manga are available for example at Amazon.co.jp. As far as I know, only one of his manga has this far been translated into English, namely Tropic of the Sea.